"No bake peanut butter bars for the peanut butter fanatic." Mix honey, sugar and salt in sauce pan over medium heat and bring to boil. Add 2 cups peanut butter and stir until dissolved. Remove from heat. Add corn flakes and mix well. Spread in 9x13 inch pan while warm. Let cool then cut in squares. Very tasty! I have made this 2x. The first time I used cornflakes and the second time I used a combination of Honey Bunches of Oats and Rice Krispies. Both were very good. Kids loved them! great recipe, easy to create it. 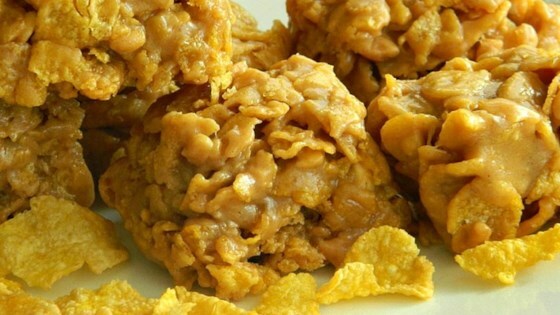 use with corn flakes but the honey flavor is overpowering the peanut butter. will use lest honey next time. Tasty. Made them two times, the second I substituted honey nut cheerios on a whim-- preferred that. (But that's just me. :)) Didn't set as well as the no-bake with corn oil recipes I've done. something about these made me feel sick to my stomach...the honey made it way to sweet...not for my taste..I perfer chocolate and peanut butter.. AWESOME AWESOME AWESOME...and soooo addicting! Beware! haha. Very good and easy for a quick dessert. My fiance had half the pan.